As you can note there were two cases where the Bitcoin established a top pattern and then fell on that top line. 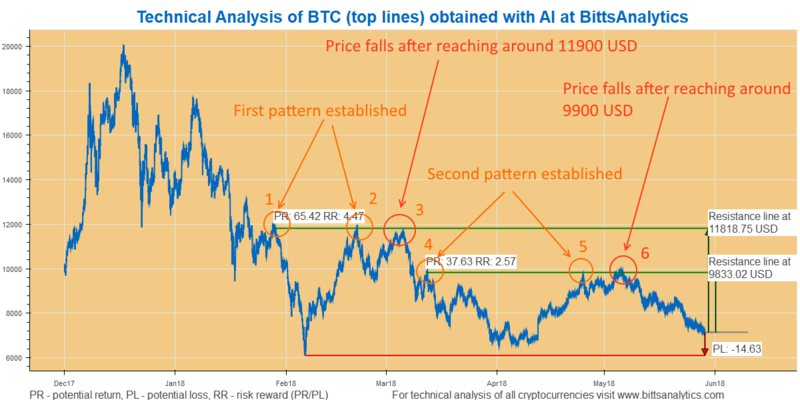 First the pattern was established by points 1 and 2 at around 11900 USD. Bitcoin then fell after reaching the level for the third time (point 3). More recently the next top pattern was established with points 4 and 5. And after reaching this level of around 9900 USD (point 6) the Bitcoin again fell and has been down almost 30% since that price.